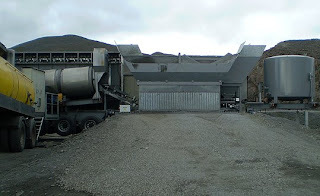 The supermobile "EasyBatch" is an aphalt mixing plant especially developped by SIM to respond to the high demand of batching plant with a medium production capacity but with a very high degree of mobility. Supermobile and supercompact batch type unit with an hourly output up to 90-100 tons, all assembled on 2 semitrailers whose dimensions are suitable to travel even on ordinary narrow roads. The width of the 2 semitrailers does not exceed 3 meters. The two semitrailers have all the necessary elements for the production preassembled, including pipelines and electrical cables, bitumen and fuel storage tanks and oleothermic heater. Mechanical jacks with supporting plates already connected allow an easy and fast plant positioning on site, no foundations and no cranes are required. The plant is supplied fully assembled and tested in SIM factory and thanks to the easy trasportability and manoeuvrability the exceptional maintenance can be carried out in a workshop during the winter season so as to reduce time and costs.